"Brahms" redirects here. For other uses, see Brahms (disambiguation). Johannes Brahms (German: [joˈhanəs ˈbʁaːms]; 7 May 1833 – 3 April 1897) was a German composer, pianist, and conductor of the Romantic period. Born in Hamburg into a Lutheran family, Brahms spent much of his professional life in Vienna, Austria. His reputation and status as a composer are such that he is sometimes grouped with Johann Sebastian Bach and Ludwig van Beethoven as one of the "Three Bs" of music, a comment originally made by the nineteenth-century conductor Hans von Bülow. Brahms's father, Johann Jakob Brahms (1806–72), was from the town of Heide in Holstein. The family name was also sometimes spelt 'Brahmst' or 'Brams', and derives from 'Bram', the German word for the shrub broom. Against the family's will, Johann Jakob pursued a career in music, arriving in Hamburg in 1826, where he found work as a jobbing musician and a string and wind player. In 1830, he married Johanna Henrika Christiane Nissen (1789–1865), a seamstress 17 years older than he was. In the same year he was appointed as a horn player in the Hamburg militia. Eventually he became a double-bass player in the Hamburg Stadttheater and the Hamburg Philharmonic Society. 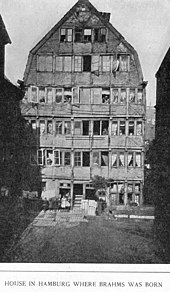 As Johann Jakob prospered, the family moved over the years to ever better accommodation in Hamburg. Johannes Brahms was born in 1833; his sister Elisabeth (Elise) had been born in 1831 and a younger brother Fritz Friedrich (Fritz) was born in 1835. Fritz also became a pianist; overshadowed by his brother, he emigrated to Caracas in 1867, and later returned to Hamburg as a teacher. Persistent stories of the impoverished adolescent Brahms playing in bars and brothels have only anecdotal provenance, and many modern scholars dismiss them; the Brahms family was relatively prosperous, and Hamburg legislation very strictly forbade music in, or the admittance of minors to, brothels. In 1853 Brahms went on a concert tour with Reményi. In late May the two visited the violinist and composer Joseph Joachim at Hanover. Brahms had earlier heard Joachim playing the solo part in Beethoven's violin concerto and been deeply impressed. Brahms played some of his own solo piano pieces for Joachim, who remembered fifty years later: "Never in the course of my artist's life have I been more completely overwhelmed". This was the beginning of a friendship which was lifelong, albeit temporarily derailed when Brahms took the side of Joachim's wife in their divorce proceedings of 1883. Brahms also admired Joachim as a composer, and in 1856 they were to embark on a mutual training exercise to improve their skills in (in Brahms's words) "double counterpoint, canons, fugues, preludes or whatever". Bozarth notes that "products of Brahms's study of counterpoint and early music over the next few years included "dance pieces, preludes and fugues for organ, and neo-Renaissance and neo-Baroque choral works." After meeting Joachim, Brahms and Reményi visited Weimar, where Brahms met Franz Liszt, Peter Cornelius, and Joachim Raff, and where Liszt performed Brahms's Op. 4 Scherzo at sight. Reményi claimed that Brahms then slept during Liszt's performance of his own Sonata in B minor; this and other disagreements led Reményi and Brahms to part company. Brahms visited Düsseldorf in October 1853, and, with a letter of introduction from Joachim, was welcomed by Schumann and his wife Clara. Schumann, greatly impressed and delighted by the 20-year-old's talent, published an article entitled "Neue Bahnen" ("New Paths") in the 28 October issue of the journal Neue Zeitschrift für Musik nominating Brahms as one who was "fated to give expression to the times in the highest and most ideal manner". This praise may have aggravated Brahms's self-critical standards of perfection and dented his confidence. He wrote to Schumann in November 1853 that his praise "will arouse such extraordinary expectations by the public that I don't know how I can begin to fulfil them". While in Düsseldorf, Brahms participated with Schumann and Schumann's pupil Albert Dietrich in writing a movement each of a violin sonata for Joachim, the "F-A-E Sonata", the letters representing the initials of Joachim's personal motto Frei aber einsam ("Free but alone"). After Schumann's attempted suicide and subsequent confinement in a mental sanatorium near Bonn in February 1854 (where he died of pneumonia in 1856), Brahms based himself in Düsseldorf, where he supported the household and dealt with business matters on Clara's behalf. Clara was not allowed to visit Robert until two days before his death, but Brahms was able to visit him and acted as a go-between. Brahms began to feel deeply for Clara, who to him represented an ideal of womanhood. Their intensely emotional platonic relationship lasted until Clara's death. In June 1854 Brahms dedicated to Clara his Op. 9, the Variations on a Theme of Schumann. Clara continued to support Brahms's career by programming his music in her recitals. After the publication of his Op. 10 Ballades for piano, Brahms published no further works until 1860. His major project of this period was the Piano Concerto in D minor, which he had begun as a work for two pianos in 1854 but soon realized needed a larger-scale format. Based in Hamburg at this time, he gained, with Clara's support, a position as musician to the tiny court of Detmold, the capital of the Principality of Lippe, where he spent the winters of 1857 to 1860 and for which he wrote his two Serenades (1858 and 1859, Opp. 11 and 16). In Hamburg he established a women's choir for which he wrote music and conducted. To this period also belong his first two Piano Quartets (Op. 25 and Op. 26) and the first movement of the third Piano Quartet, which eventually appeared in 1875. The end of the decade brought professional setbacks for Brahms. The premiere of the First Piano Concerto in Hamburg on 22 January 1859, with the composer as soloist, was poorly received. Brahms wrote to Joachim that the performance was "a brilliant and decisive – failure...[I]t forces one to concentrate one's thoughts and increases one's courage...But the hissing was too much of a good thing..." At a second performance, audience reaction was so hostile that Brahms had to be restrained from leaving the stage after the first movement. As a consequence of these reactions Breitkopf and Härtel declined to take on his new compositions. Brahms consequently established a relationship with other publishers, including Simrock, who eventually became his major publishing partner. Brahms further made an intervention in 1860 in the debate on the future of German music which seriously misfired. Together with Joachim and others, he prepared an attack on Liszt's followers, the so-called "New German School" (although Brahms himself was sympathetic to the music of Richard Wagner, the School's leading light). In particular they objected to the rejection of traditional musical forms and to the "rank, miserable weeds growing from Liszt-like fantasias". A draft was leaked to the press, and the Neue Zeitschrift für Musik published a parody which ridiculed Brahms and his associates as backward-looking. Brahms never again ventured into public musical polemics. 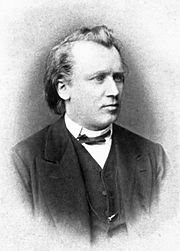 Brahms had hoped to be given the conductorship of the Hamburg Philharmonic, but in 1862 this post was given to the baritone Julius Stockhausen. (Brahms continued to hope for the post; but when he was finally offered the directorship in 1893, he demurred as he had "got used to the idea of having to go along other paths".) In autumn 1862 Brahms made his first visit to Vienna, staying there over the winter. There he became an associate of two close members of Wagner's circle, his earlier friend Peter Cornelius and Karl Tausig, and of Joseph Hellmesberger Sr. and Julius Epstein, respectively the Director and head of violin studies, and the head of piano studies, at the Vienna Conservatoire. Brahms's circle grew to include the notable critic (and opponent of the 'New German School') Eduard Hanslick, the conductor Hermann Levi and the surgeon Theodor Billroth, who were to become amongst his greatest advocates. In January 1863 came Brahms's first meeting with Richard Wagner, for whom he played his Handel Variations Op. 24, which he had completed the previous year. The meeting was cordial, although Wagner was in later years to make critical, and even insulting, comments on Brahms's music. Brahms however retained at this time and later a keen interest in Wagner's music, helping with preparations for Wagner's Vienna concerts in 1862/63, and being rewarded by Tausig with a manuscript of part of Wagner's Tannhäuser (which Wagner demanded back in 1875). The Handel Variations also featured, together with the first Piano Quartet, in Brahms's first Viennese recitals, in which his performances were better-received by the public and critics than his music. Although Brahms entertained the idea of taking up conducting posts elsewhere, he based himself increasingly in Vienna and soon made it his home. In 1863, he was appointed conductor of the Vienna Singakademie. He surprised his audiences by programming much work of the early German masters such as J. S. Bach and Heinrich Schütz and other early composers such as Giovanni Gabrieli; more recent music was represented by works of Beethoven and Felix Mendelssohn. He also wrote works for the choir, including his Op. 29 "Motet". Finding however that the post encroached too much of the time he needed for composing, he left the choir in June 1864. From 1864 to 1876 he spent many of his summers in Lichtental, today part of Baden-Baden, where Clara Schumann and her family also spent some time. His house in Lichtental, where he worked on many of his major compositions including A German Requiem and his middle-period chamber works is today preserved as a museum. In February 1865 Brahms's mother died, and he began to compose his large choral work A German Requiem Op. 45, of which six movements were completed by 1866. Premieres of the first three movements were given in Vienna, but the complete work was first given in Bremen in 1868 to great acclaim. A seventh movement (the soprano solo "Ihr habt nun Traurigkeit") was added for the equally successful Leipzig premiere (February 1869), and the work went on to receive concert and critical acclaim throughout Germany and also in England, Switzerland and Russia, marking effectively Brahms's arrival on the world stage. 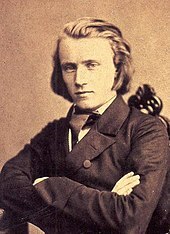 Brahms also experienced at this period popular success with works such as his first set of Hungarian Dances (1869), the Liebeslieder Walzer, Op. 52, (1868/69), and his collections of lieder (Opp. 43 and 46–49). Following such successes he finally completed a number of works that he had wrestled with over many years such as the cantata Rinaldo (1863–1868), his first two string quartets Op. 51 nos. 1 and 2 (1865–1873), the third piano quartet (1855–1875), and most notably his first symphony which appeared in 1876, but which had been begun as early as 1855. From 1872 to 1875, Brahms was director of the concerts of the Vienna Gesellschaft der Musikfreunde. He ensured that the orchestra was staffed only by professionals, and conducted a repertoire which ran from Bach to the nineteenth century composers who were not of the 'New German School'; these included Beethoven, Franz Schubert, Mendelssohn, Schumann, Joachim, Ferdinand Hiller, Max Bruch and himself (notably his large scale choral works, the German Requiem, the Alto Rhapsody, Op. 53, and the patriotic Triumphlied, Op. 55, which celebrated Prussia's victory in the 1870/71 Franco-Prussian War). 1873 saw the premiere of his orchestral Variations on a Theme by Haydn, originally conceived for two pianos, which has become one of his most popular works. Brahms's first symphony, Op. 68, appeared in 1876, though it had been begun (and a version of the first movement had been announced by Brahms to Clara and to Albert Dietrich) in the early 1860s. During the decade it evolved very gradually; the finale may not have begun its conception until 1868. Brahms was cautious and typically self-deprecating about the symphony during its creation, writing to his friends that it was "long and difficult", "not exactly charming" and, significantly "long and in C Minor", which, as Richard Taruskin points out, made it clear "that Brahms was taking on the model of models [for a symphony]: Beethoven's Fifth." Despite the warm reception the first symphony received, Brahms remained dissatisfied and extensively revised the second movement before the work was published. There followed a succession of well-received orchestral works; the Second Symphony Op. 73 (1877), the Violin concerto Op. 77 (1878), dedicated to Joachim who was consulted closely during its composition, and the Academic Festival Overture (written following the conferring of an honorary degree by the University of Breslau) and Tragic Overture of 1880. The commendation of Brahms by Breslau as "the leader in the art of serious music in Germany today" led to a bilious comment from Wagner in his essay "On Poetry and Composition": "I know of some famous composers who in their concert masquerades don the disguise of a street-singer one day, the hallelujah periwig of Handel the next, the dress of a Jewish Czardas-fiddler another time, and then again the guise of a highly respectable symphony dressed up as Number Ten" (referring to Brahms's First Symphony as a putative tenth symphony of Beethoven). Brahms was now recognised as a major figure in the world of music. He had been on the jury which awarded the Vienna State Prize to the (then little-known) composer Antonín Dvořák three times, first in February 1875, and later in 1876 and 1877 and had successfully recommended Dvořák to his publisher, Simrock. The two men met for the first time in 1877, and Dvořák dedicated to Brahms his String Quartet, Op. 44 of that year. He also began to be the recipient of a variety of honours; Ludwig II of Bavaria awarded him the Maximilian Order for Science and Art in 1874, and the music loving Duke George of Meiningen awarded him in 1881 the Commander's Cross of the Order of the House of Meiningen. 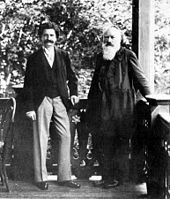 Brahms had become acquainted with Johann Strauss II, who was eight years his senior, in the 1870s, but their close friendship belongs to the years 1889 and after. Brahms admired much of Strauss's music, and encouraged the composer to sign up with his publisher Simrock. In autographing a fan for Strauss's wife Adele, Brahms wrote the opening notes of The Blue Danube waltz, adding the words "unfortunately not by Johannes Brahms". After the successful Vienna premiere of his Second String Quintet, op. 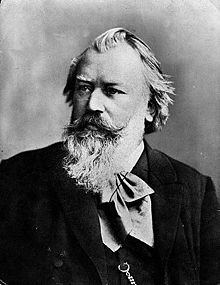 111, in 1890, the 57-year-old Brahms came to think that he might retire from composition, telling a friend that he "had achieved enough; here I had before me a carefree old age and could enjoy it in peace." He also began to find solace in escorting the mezzo-soprano Alice Barbi and may have proposed to her (she was only 28). His admiration for Richard Mühlfeld, clarinettist with the Meiningen orchestra, revived his interest in composing and led him to write the Clarinet Trio, Op. 114, Clarinet Quintet, Op. 115 (1891), and the two Clarinet Sonatas, Op. 120 (1894). Brahms also wrote at this time his final cycles of piano pieces, Opp. 116–19, the Vier ernste Gesänge (Four Serious Songs), Op. 121 (1896) (which were prompted by the death of Clara Schumann), and the Eleven Chorale Preludes for organ, Op. 122 (1896). The last of these is a setting of "O Welt ich muss dich lassen", ("O world I must leave thee"), and are the last notes that Brahms wrote. Many of these works were written in his house in Bad Ischl, where Brahms had first visited in 1882 and where he spent every summer from 1889 onwards. In the summer of 1896 Brahms was diagnosed as having jaundice, but later in the year his Viennese doctor diagnosed him as having cancer of the liver (from which his father Jakob had died). Brahms's last public appearance was on 3 March 1897, when he saw Hans Richter conduct his Symphony No. 4. There was an ovation after each of the four movements. He made the effort, three weeks before his death, to attend the premiere of Johann Strauss's operetta Die Göttin der Vernunft (The Goddess of Reason) in March 1897. His condition gradually worsened and he died on 3 April 1897, in Vienna, aged 63. Brahms is buried in the Zentralfriedhof in Vienna, under a monument designed by Victor Horta with sculpture by Ilse von Twardowski. Brahms venerated Beethoven; in the composer's home, a marble bust of Beethoven looked down on the spot where he composed, and some passages in his works are reminiscent of Beethoven's style. Brahms's First Symphony bears strongly the influence of Beethoven's Fifth Symphony, as the two works are both in C minor and end in the struggle towards a C major triumph. The main theme of the finale of the First Symphony is also reminiscent of the main theme of the finale of Beethoven's Ninth, and when this resemblance was pointed out to Brahms he replied that any dunce could see that. In 1876, when the work was premiered in Vienna, it was immediately hailed as "Beethoven's Tenth". Indeed, the similarity of Brahms's music to that of late Beethoven had first been noted as early as November 1853 in a letter from Albert Dietrich to Ernst Naumann. Brahms's consummate skills in counterpoint and rhythm are richly present in A German Requiem, a work that was partially inspired by his mother's death in 1865 (at which time he composed a funeral march that was to become the basis of Part Two, Denn alles Fleisch), but which also incorporates material from a symphony which he started in 1854 but abandoned following Schumann's suicide attempt. He once wrote that the Requiem "belonged to Schumann". The first movement of this abandoned symphony was re-worked as the first movement of the First Piano Concerto. Brahms considered giving up composition when it seemed that other composers' innovations in extended tonality resulted in the rule of tonality being broken altogether. Although Wagner became fiercely critical of Brahms as the latter grew in stature and popularity, he was enthusiastically receptive of the early Variations and Fugue on a Theme by Handel; Brahms himself, according to many sources, deeply admired Wagner's music, confining his ambivalence only to the dramaturgical precepts of Wagner's theory. Brahms wrote settings for piano and voice of 144 German folk songs, and many of his lieder reflect folk themes or depict scenes of rural life. His chamber works include three string quartets, two string quintets, two string sextets, a clarinet quintet, a clarinet trio, a horn trio, a piano quintet, three piano quartets, and four piano trios (the fourth being published posthumously). He composed several instrumental sonatas with piano, including three for violin, two for cello, and two for clarinet (which were subsequently arranged for viola by the composer). His solo piano works range from his early piano sonatas and ballades to his late sets of character pieces. Brahms was a significant Lieder composer, who wrote over 200 of them. His chorale preludes for organ, Op. 122, which he wrote shortly before his death, have become an important part of the organ repertoire. They were published posthumously in 1902 The last of this set is a setting of the chorale, "O Welt ich muss dich lassen", "O world I now must leave thee" and were the last notes he wrote. It is often not acknowledged that Brahms, along with Robert and Clara Schumann, Mendelssohn, Liszt and Bruckner were all organists. Despite his mastery of large, complex musical structures, some of Brahms's most popular compositions during his lifetime were small-scale works that were readily accessible to the contemporary market for domestic music-making. Among these lighter works by Brahms are his sets of popular dances, the Hungarian Dances, the Waltzes for piano duet (Op. 39), and the Liebeslieder Walzer, Op. 52. Brahms's point of view looked both backward and forward; his output was often bold in its exploration of harmony and rhythm. As a result, he was an influence on composers of both conservative and modernist tendencies. Within his lifetime, his idiom left an imprint on several composers within his personal circle, who strongly admired his music, such as Heinrich von Herzogenberg, Robert Fuchs, and Julius Röntgen, as well as on Gustav Jenner, who was Brahms's only formal composition pupil. Antonín Dvořák, who received substantial assistance from Brahms, deeply admired his music and was influenced by it in several works, such as the Symphony No. 7 in D minor and the F minor Piano Trio. Features of the "Brahms style" were absorbed in a more complex synthesis with other contemporary (chiefly Wagnerian) trends by Hans Rott, Wilhelm Berger, Max Reger and Franz Schmidt, whereas the British composers Hubert Parry and Edward Elgar and the Swede Wilhelm Stenhammar all testified to learning much from Brahms's example. As Elgar said, "I look at the Third Symphony of Brahms, and I feel like a pygmy." Ferruccio Busoni's early music shows much Brahmsian influence, and Brahms took an interest in him, though Busoni later tended to disparage Brahms. Towards the end of his life, Brahms offered substantial encouragement to Ernő Dohnányi and to Alexander von Zemlinsky. Their early chamber works (and those of Béla Bartók, who was friendly with Dohnányi) show a thoroughgoing absorption of the Brahmsian idiom. Zemlinsky, moreover, was in turn the teacher of Arnold Schoenberg, and Brahms was apparently impressed by drafts of two movements of Schoenberg's early Quartet in D major which Zemlinsky showed him in 1897. In 1933, Schoenberg wrote an essay "Brahms the Progressive" (re-written 1947), which drew attention to Brahms's fondness for motivic saturation and irregularities of rhythm and phrase; in his last book (Structural Functions of Harmony, 1948), he analysed Brahms's "enriched harmony" and exploration of remote tonal regions. These efforts paved the way for a re-evaluation of Brahms's reputation in the 20th century. Schoenberg went so far as to orchestrate one of Brahms's piano quartets. Schoenberg's pupil Anton Webern, in his 1933 lectures, posthumously published under the title The Path to the New Music, claimed Brahms as one who had anticipated the developments of the Second Viennese School, and Webern's own Op. 1, an orchestral passacaglia, is clearly in part a homage to, and development of, the variation techniques of the passacaglia-finale of Brahms's Fourth Symphony. Ann Scott has shown how Brahms anticipated the procedures of the serialists by redistributing melodic fragments between instruments, as in the first movement of the Clarinet Sonata, Op.120 No. 2. Brahms was honoured in the German hall of fame, the Walhalla memorial. On 14 September 2000, he was introduced there as the 126th "rühmlich ausgezeichneter Teutscher" and 13th composer among them, with a bust by sculptor Milan Knobloch [de]. Brahms has been described as an agnostic and a humanist. The devout Catholic Antonín Dvořák wrote in a letter: "Such a man, such a fine soul – and he believes in nothing! He believes in nothing!" When asked by conductor Karl Reinthaler to add additional explicitly religious text to his German Requiem, Brahms is reported to have responded, "As far as the text is concerned, I confess that I would gladly omit even the word German and instead use Human; also with my best knowledge and will I would dispense with passages like John 3:16. On the other hand, I have chosen one thing or another because I am a musician, because I needed it, and because with my venerable authors I can't delete or dispute anything. But I had better stop before I say too much." ^ Swafford (1999), p. 7. ^ Hofmann (1999), pp. 3–4. ^ Hofmann (1999), pp. 4–8. ^ Swafford (1999), pp. 14–16. ^ Musgrave (2000), p. 13. ^ Hofmann (1999), pp. 9–11. ^ Hofmann (1999), p. 12. ^ Swafford (1999), p. 26. ^ Hofmann (1999), pp. 17–18. ^ Hofmann (1999), pp. 16, 18–20. ^ Including allegedly tales told by Brahms himself to Clara Schumann and others; see Jan Swafford, "'Aimez-Vous Brahms': An Exchange", New York Review of Books 18 March 1999, NWRB website, accessed 1 July 2018. ^ Hofmann (1999) pp. 12–14. ^ Swafford (1999), pp. 56, 62; Musgrave (1999b), p. 45. ^ Swafford (1999), pp. 56–57. ^ Swafford (1999), p. 49. ^ Swafford (1999), p. 64. ^ Swafford (1999), pp. 494–95. ^ Musgrave (2000), p. 67. ^ a b c d e Bozarth (n.d.), §2: "New Paths". ^ a b Schumann (1988), pp. 199–200. ^ Swafford (1999), pp. 81–82. ^ Swafford (1999), pp. 180, 182. ^ Swafford (1997), pp. 189–90. ^ Swafford (1997), p. 211. ^ Swafford (1997), pp. 206–11. ^ Musgrave (2000), pp. 52–53. ^ .Musgrave (2000), pp. 27, 31. ^ Musgrave (1999b), pp. 39–41. ^ a b c d Bozarth (n.d.), §3 "First maturity"
^ Swafford (1999), pp. 265–69. ^ Swafford (1999), p. 401. ^ Musgrave (1999b), p. 39. ^ Swafford (1999), pp. 277–79, 283. ^ Hofmann (2010), p. 40; "Brahms House", on website of the Schumann Portal, accessed 22 December 2016. ^ Becker (1980), pp. 174–79. ^ a b c d Bozarth (n.d.). §4, "At the summit"
^ Swafford (1999), p. 383. ^ Musgrave (1999b), pp. 42–43. ^ Taruskin (2010), p. 694. ^ Taruskin (2010), p. 729. ^ Hofmann (2010), p. 57. ^ Swafford (1999), pp. 465–66. ^ Musgrave (2000), p. 252. ^ Musgrave (2000), pp. 253–54. ^ Swafford (1997), pp. 568–69. ^ Swafford (1997), p. 569. ^ Swafford (1997), pp. 607–08. ^ Bond (1971), p. 898. ^ Hofmann (2010), p. 42. ^ Swafford (1997), pp. 614–15. ^ Floros, Constantin (2010). Johannes Brahms, Free But Alone: A Life for a Poetic Music. Peter Lang. ISBN 978-3631612606. OCLC 864241653. Retrieved 8 October 2017 – via Google Books. ^ Dietrich, Albert Hermann; Widmann, J.V. (2000). Recollections of Johannes Brahms. The Minerva Group, Inc. ISBN 978-0898751413. OCLC 50646747. Retrieved 8 October 2017 – via Google Books. ^ Swafford (2012), p. 159. ^ Phillips, P. (2007) sleeve note to English Madrigals, 25th anniversary edition, CD recording, Gimell Records. ^ a b James Webster, "Schubert's sonata form and Brahms's first maturity (II)", 19th-Century Music 3(1) (1979), pp. 52–71. ^ Donald Francis Tovey, "Franz Schubert" (1927), rpt. in Essays and Lectures on Music (London, 1949), p. 123. Cf. his similar remarks in "Tonality in Schubert" (1928), rpt. ibid., p. 151. ^ Charles Rosen, "Influence: plagiarism and inspiration", 19th-Century Music 4(2) (1980), pp. 87–100. ^ H.V. Spanner, "What is originality? ", The Musical Times 93(1313) (1952), pp. 310–11. ^ MacDonald, Brahms (1990), p. 406. ^ Thematic transmutation in the music of Brahms: A matter of musical alchemy. Journal of Musicological Research, 15:177–206. ^ "Johannes Brahms hält Einzug in die Walhalla". Bayerisches Staatsministerium für Wissenschaft, Forschung und Kunst. 14 September 2000. Retrieved 23 April 2008. ^ Swafford, 2012, p. 327: "He continued, in high theological mode. Brahms was not about to put up with that sort of thing. He was a humanist and an agnostic, and his Requiem was going to express that, Reinthaler or no." ^ Sams, Eric (2000). The Songs of Johannes Brahms. Yale University Press. p. 326. ISBN 978-0300079623. But the thought of bright nearness brings back the face-to-face music of 'Von Angesicht zu Angesichte', which is as close as the agnostic Brahms ever came to a communion with deity. As the pious aria ends, the humanist moral returns. ^ Musgrave, Michael (1986). The Music of Brahms. Routledge Kegan & Paul. p. 80. ISBN 978-0710097767. Avins, Styra (2001). "The Young Brahms: Biographical Data Reexamined". 19th-Century Music. 24 (3): 276–89. doi:10.1525/ncm.2001.24.3.276. JSTOR 746931. Musgrave, Michael (ed.) (1999a). The Cambridge Companion to Brahms. Cambridge: Cambridge University Press. ISBN 978-0521485814. Swafford, Jan, (1999). Johannes Brahms: A Biography. London: Macmillan. ISBN 978-0333725894. Swafford, Jan (2001). "Did the Young Brahms Play Piano in Waterfront Bars?". 19th-Century Music. 24 (3): 268–75. doi:10.1525/ncm.2001.24.3.268. ISSN 0148-2076. JSTOR 10.1525/ncm.2001.24.3.268. "Discovering Brahms". BBC Radio 3.